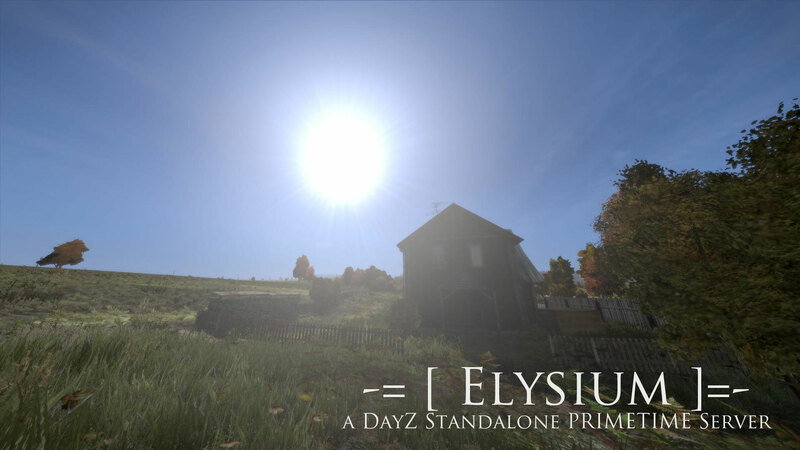 Elysium is a server for DayZ Standalone. It will be on a private shard protected by a whitelist. You can find all planned features in the feature list. Will Third Person be enabled? No. It will be a first person server. We were all fans of the third person mode, but we found out that first person is much more engaging and fair. When you are accepted on the server, your ingame-id will be put on this list – server side. Only players on this list will be able to connect to Elysium. What is the difference between Elysium and public Dayz Standalone Server? What is a private shard? Elysium will run on it’s own shard, so players will have their “own” character on Elysium. You cannot take gear from the public servers to Elysium as well as it’s impossible to bring gear from Elysium to a public server. Why should I play on Elysium? You should play on Elysium if you like to communicate, play a role on the server and like to take part in exciting events. Apply for the whitelist by registering. When you are finished let us know by pressing “verify” in the profile menu. We will then check your data. Shortly after you will be informed if your application is accepted. Can I register without applying to the whitelist? Yes, you can register only with your email address but you can fill all the blank spots later. Do I have to write a background story? How long does it have to be? Yes, we require you to write a background story. It should let us know where you came from, how you got to Chenarus, what you were doing before the apocalypse and what you expect to do from now on. We want to read about whether you are a bandit, a hero, or just some other guy trying to survive. I don’t have a working microphone, can I still join? Sorry, no. Communication is the biggest foundation this server is build upon, so if you like to join, please go buy a microphone. My english is not good, is that a problem? Absolutly not. If it’s good enough for you to write a good background story it’s enough to get by on the server. We always enjoyed meeting people from all over the world on our server, so you’re most welcome. I am under 18 years old, can I join? How many slots has the Elysium whitelist? We will see. We think Elysium will be able to hold 100 players, if that number is available anytime soon. Are there still slots available? What rules do I have to follow on Elysium? What is a PRIME TIME? It’s the time when most players are active on the server on a regular basis, like from 20-23h (8pm – 11pm). PRIME TIME will be announced. Special characters will be online at that time as well as it’s the timeframe for events to take place. What is a trained event actor? It’s preferable someone with experience in acting, roleplaying or impro theatre. He or she has been instructed about a specific event and their respective roles to play. At best the event has been rehearsed at least once. We will recruit further event actors so let us know if you’re interested in joining. Can I play a set role on the server (i.e. become a trader, a medic)? Yes, of course. If you like to play a set role, let us know how we can support you when doing so. Please note we can and will not spawn items for you. We all have to find that stuff ourselves. How can I publish my endeavours on Elysium? Will the server support a custom loadout (i.e. more vehicles, different starting gear)? How can I support you guys? Please head over to the jobs/tasks section, to see if have any open positions to fill or tasks to accomplish. If you are a reddit or DayZ Forums user, please upvote or give Beans to our posts, which we linked here. When the server is up and running we will also create a Donation page, so we can share the costs of the server hosting. I have a question that is not answered through this FAQ! Please head over to the forums and don’t hesitate to ask.